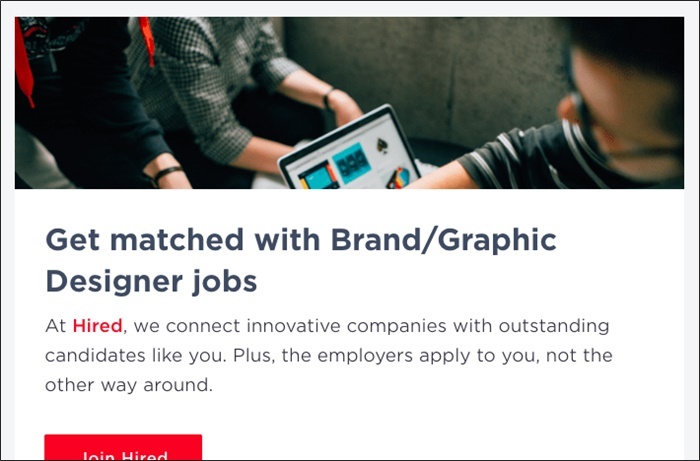 Finding the best remote graphic design jobs in a sea of low-balling clients and outright scammers can be a bit of a challenge, though. So today, I’ve compiled a list of the best sites I know of to find remote graphic design jobs quickly and relatively easily. The list comes from over a decade personally freelancing/side-hustling and also helping thousands of freelancers start their own graphic design business through my blog. Nick’s Notes: Preston Lee contributed this post. Preston is the founder of Millo, a blog he started 10 years ago as a side hustle. If that name sounds familiar, he was featured in episode 300 of The Side Hustle Show! Today, he works full-time for himself helping freelancers and solopreneurs start, grow, or scale their businesses. Because this list is meant primarily for side-hustlers, there are a few key criteria I used when filtering through the zillions of graphic design job sites around the web. Must offer a wide range of actual high quality remote graphic design jobs. Must offer primarily freelance remote graphic design jobs which can be completed in a side-hustler’s hours outside the office. Should accept side-hustlers and freelancers from all over the world who are looking for remote graphic design jobs. It’s also important to keep this in mind: what works well for one designer, may not work well for another. Some designers will stick up their noses at some of these sites. And that’s OK. We are each in different stages in our design careers. It’s also worth noting that some of the sites I recommend are 100% free to the designer. Others require a small monthly fee. I will never recommend you pay for a site that I haven’t personally used and verified it’s worth the monthly payment. This list is most helpful for graphic designers who are looking for more remote graphic design jobs to start or grow their portfolio, build confidence, and bring in some extra side-hustle income. With that goal in mind, I dug through the gigantic list of freelance job sites my team keeps always on-hand and sorted out the best results below. I’ll share a bit about why each site is a good idea for finding remote graphic design jobs as well as some of the pros or cons for each so you can make a decision on which sites to try for yourself. First on the list is one of my personal favorites: Flexjobs. They bill themselves as “the best remote work online job site” and I have to admit, it makes sense why they say that. There are a few reasons I recommend Flexjobs for anyone looking for remote graphic design jobs. Primarily, I love the sheer volume of quality jobs they post on a daily basis. With over 50 categories (obviously, not all in graphic design, but many related) there’s always a new opportunity just around the corner too. Learn more about remote graphic design jobs on Flexjobs, and save 30% on your membership w/ promo code FLEXLIFE. 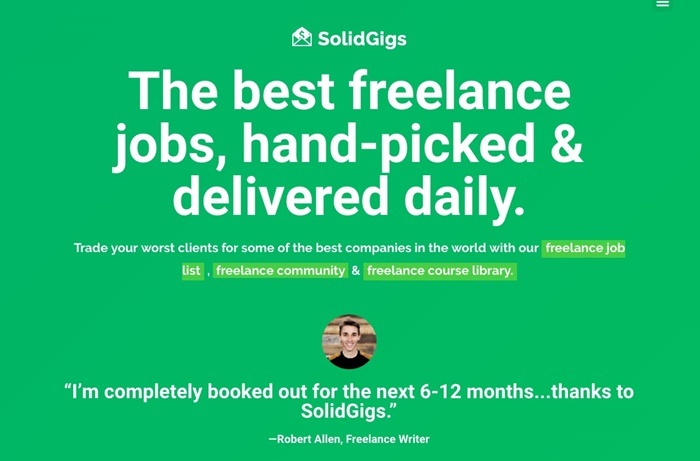 Next on the list is SolidGigs—a hand-curated list of freelance jobs updated daily. The team at SolidGigs (which I also happen to be a part of, in full transparency) combs through dozens of freelance job boards every weekday and posts the top 1% of jobs to their freelance job stream. FreeeUp is a relatively new freelancer marketplace with a bit of a twist. Connect clients with the top 1% of freelancers on the market. While this does mean you have to do more than just sign up for the site and hope for new clients (there’s a 5-step questionnaire that feels a bit like an interview), it also means the remote graphic design jobs you find through FreeeUp pay above-average rates. Visit FreeeUp and see if you qualify to join as a freelancer. In the same vein, Toptal is another premium freelance job site that pre-vets freelancers in order to provide a better client/freelancer experience and offer above-average rates for their designers. What’s great about Toptal–if you can pass their rigorous sign-up interview–is that they have a really great client pool history. Companies like Airbnb, Hewlett Packer, and Pfizer all hire using Toptal. Co-founded by Sara Sutton, the same founder of Flexjobs (see #1 on this list), Remote.co is specifically tailored to online jobs that are 100% flexible in their location. They’ve also got remote graphic design jobs from big-name companies. For example, at the time of writing this post, their design category had fresh new freelance jobs at Amazon and InVision right in the first page of results. Best of all: for now, Remote.co is free to join. You can learn more here. 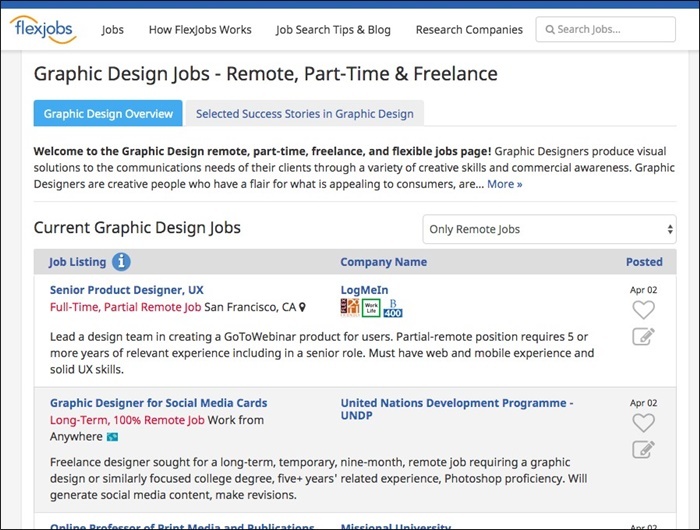 Next on the list is a more unique solution for finding remote graphic design jobs. Hired puts a twist on the typical freelance job search process by getting clients to apply to hire you–not the other way around. As an added bonus (especially for side-hustlers) you can even hide your profile and other information from current and previous employers which means you’re safe to build your graphic design business after hours. Learn more about Hired and create an account to get started. Another company dedicated to helping you work from home is Virtual Vocations. The site was founded by brother/sister team Laura Spawn and Adam Stevenson. They’ve been helping freelancers find remote jobs since 2007 and their site has an extensive and robust list of remote graphic design jobs updated regularly. While you do have to pay for a membership at Virtual Vocations, if the kinds of jobs they provide you are what you’re looking for, the cost is extremely reasonable. Take a look and see if Virtual Vocations is the right fit for you. 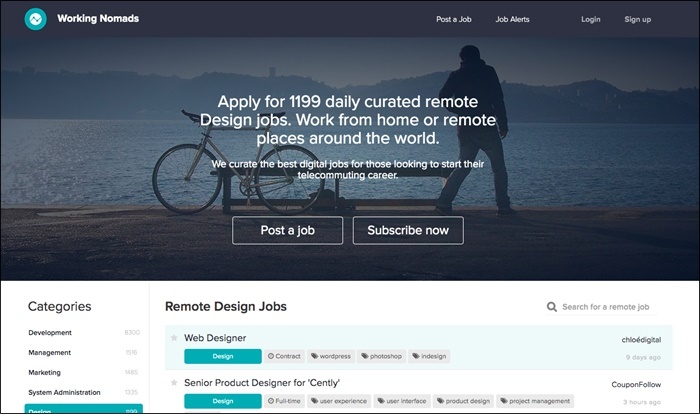 Started by fellow remote-worker Mike Desjardins, Remotely Awesome Jobs combs 10 of Mike’s favorite remote job boards every day to bring you a wide variety of new remote graphic design jobs. There are some definite advantages to this platform including the fact that you don’t have to sign up for an account and the feed is updated pretty regularly. Unfortunately, although they claim they comb more remote work sites than most others, I’m afraid they’re mistaken. In the world of remote job sites, 10 simply isn’t that many. Overall, while this is a good starting point, it can’t be the only place you search for remote graphic design jobs online. The next remote graphic design jobs site comes from a company that has been serving designers for about a decade. Dribbble is a platform for showing off your design work to other designers and potential clients. 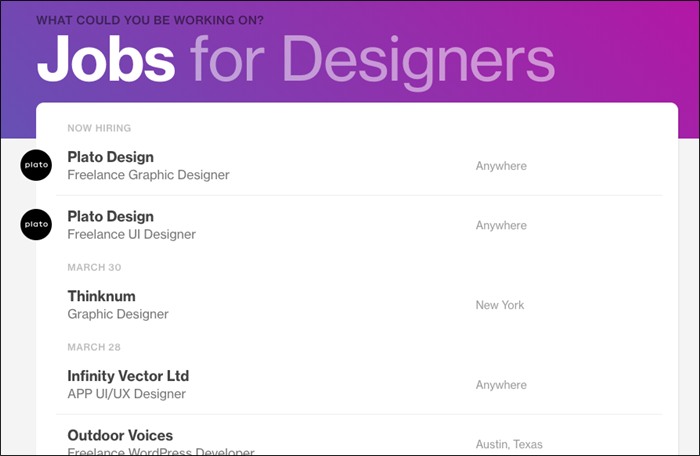 Their job board is also a great way to find remote graphic design jobs with companies from all over the world since you can filter by location (choose “Anywhere”) and whether you want a full-time, part-time, or contract position. Learn more about Dribbble’s job board by clicking here. You can also follow @dribbblejobs to get job updates in your Twitter feed. Founded by designer Cameron Moll, Authentic Jobs strives to do precisely what its name purports: provide authentic jobs to creatives around the world. While there are a lot of full-time positions that probably won’t work if you’re looking for remote graphic design jobs you can do on the side, there are still quite a few gems that come through for freelancers and side-hustlers on a regular basis. Click here to see if Authentic Jobs might be a good fit for you. Describing itself as “the largest community on the web … to find and list remote jobs”, We Work Remotely posts new remote graphic design jobs on an almost-daily basis. You can also sign up for timely email alerts with specific filters which is a nice added bonus if you don’t have the time or memory to check the site every few hours. While the site does skew a bit more towards product design, UX design, and other tech-related fields, there are definitely graphic design positions from time to time and it’s a site worth bookmarking. Learn more about remote graphic design jobs on WWR. While many of their jobs are full-time positions which may not work for a side-hustler’s needs, Working Nomads’ design category is enormous! If you’re having a hard time finding jobs on their site, just do an on-page search for “contract” or “part-time” depending on what you’re looking for. Working Nomads was founded by a couple of nomadic workers (working from anywhere in the world; usually traveling from city to city) so they have a good idea of what kind of companies offer quality remote graphic design jobs. To learn more about Working Nomads, click here. My next suggestion isn’t actually a site dedicated to remote graphic design jobs. Instead, it’s a Facebook group. Honestly, the group can be a bit hit-or-miss, but when a decent job comes through, it’s nice to know about it. For this one, you’ll of course need a Facebook account. And to be among the first to see when a new job is posted to the group, you’ll have to adjust your Facebook alert settings. Join the free “Freelance Graphic Design Jobs from Home” group on Facebook. Side note: There are also quite a few other Facebook groups for finding remote graphic design jobs. Some are good, others aren’t so great. It’s up to you, but may be worth taking an hour or two and exploring. Rounding out the list is a site that describes itself as the #1 remote jobs board. While I’m not sure that is 100% factually accurate, one thing is for certain: Remote OK is a quality destination for finding remote jobs of all kinds, including remote graphic design jobs. Similar to a few other sites in this list, Remote OK leans toward more tech-oriented design jobs (product design, UX design, etc.) but does have some quality gigs pop up on a regular basis. Visit Remote OK to see if their remote graphic design jobs are a good fit. Now that you have the list, I’d like to offer a final piece of advice. There’s a lot more to it than just finding jobs when it comes to starting and growing a sustainable service-based side-hustle such as being a graphic designer. Whether you want to stay small and thrive as a freelancer, or scale your side-hustle design business up fast, you’re going to have to learn a few things. and a million other elements it requires to run a remote graphic design business smoothly. 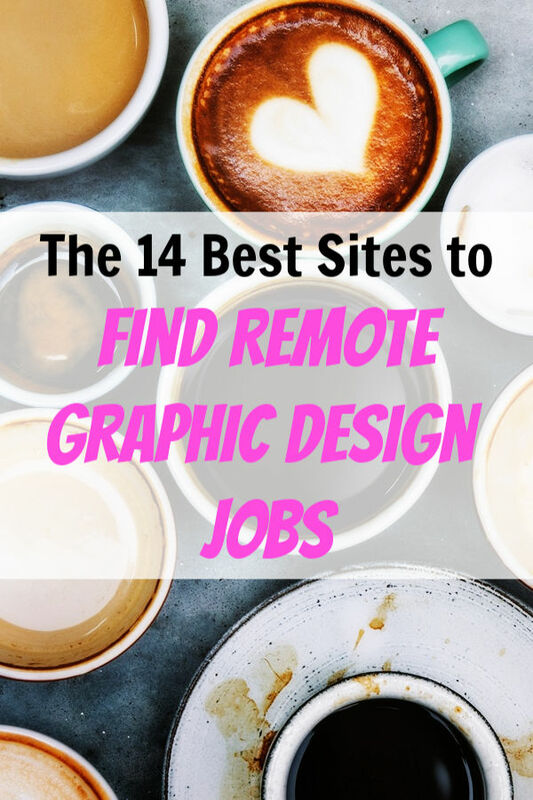 Yes, hunting down new remote graphic design jobs using this list is a good use of time. Another good use of time includes teaching yourself the skills necessary to thrive as a side-hustler and freelancer. For that, you can use this blog, any number of incredible Udemy courses, and a lot of trial and error. I wish you the very best in your mission to hunt down (and win!) remote graphic design jobs wherever you may find them. This is off the hook! A great reference for my future prospects. Cheers!